It's a digital age and kids are more and more interested in ways they can play with electronics. I'll say it's time to get creative and help them explore both on and off electronics. With the new Charmazing bracelet sets you can do just that. First kids get to use their hands and minds to create awesome bracelets from beads and charms. Then when they are finished they can explore the digital world of Charmazing through the Charmazing app. My daughter is naturally a creative person so she opted to not follow the enclosed direction sheet that gave ways to make the bracelets. Honestly I think that's the best way to go because it lets them use their creativity to the fullest. But for those that don't like to think up their own patterns there are nice ones provided for them with easy to follow instructions. Each bracelet gets two of the charms that also have matching cards to tell all about the charms for app use. The cards are later scanned into the app and added to your personal collection where you can trade with friends and other fashionistas! 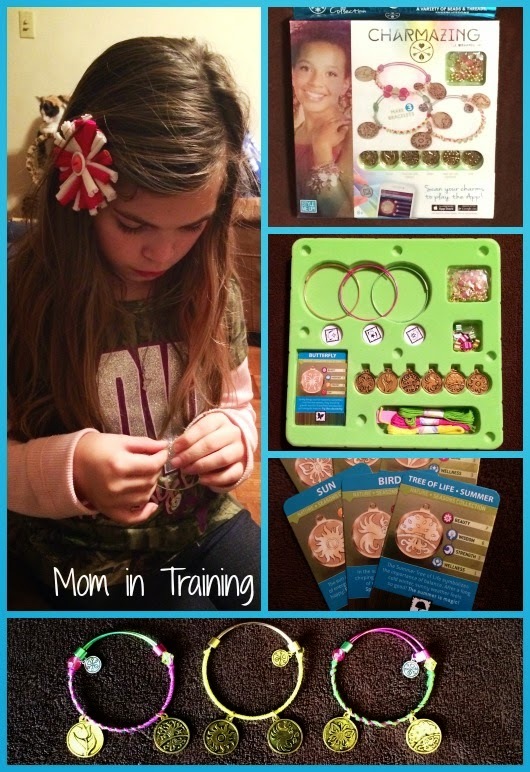 My daughter really enjoyed making the bracelets and even took one to school to share with a friend so they can play the app when they play together. Now that's a great way to get kids to connect both on and off electronics if you ask me. Trendsetters can activate their “charma” with the all-new Charmazing Style Me Up! collection from Wooky Entertainment, the international creativity products leader known for its best-selling Style Me Up! range of fashion-forward activity sets for tweens. Available exclusively at Toys“R”Us, Charmazing offers young designers the chance to create custom charm bracelets, which they can wear, share and gift. Additionally, kids can scan their Charmazing charms into a virtual Charmazing world where they can trade with friends and connect with other fashionistas via an inventive new app. Charmazing provides tweens with more than 100 different charms in 11 unique themed collections categorized in two worlds, Karma (positive energy) and Nature (powerful energy). • Charmazing Let’s Get Started – Creativity starts here with this set that comes in 5 different collections, enabling designers to personalize their bracelets according to these themes: Wildlife, Seaside, Lucky, Heart, and Emoji. • Charmazing Charmastation – A unique bracelet workstation that keeps individual bracelets secure so charmasters can work their creative magic. Additionally, there’s a storage compartment to neatly stow and organize materials. • Charmazing Color Me Up! – There is a rainbow of customizable options from 3 inspiring themed collections: Seaside, Seasons and Heart. Each features 6 charms, energy cards and beads. • Charmazing Deluxe Kit – This complete set comes in both Karma and Nature World themes, enabling tweens to design 6 unique bracelets. Also included is the Charmastation bracelet working station, thread, beads, and chains. Buy it: You can purchase Charmazing Bracelet Kits exclusively at Toys“R”Us stores nationwide and online at Toysrus.com.